Happy π day! This is a day typically celebrated by science geeks, math whizzes, and number lovers, but has also been amicably co-opted by lovers of pie. It wasn’t until late last night that I realized Pi Day was practically upon me, and whereas last year I failed to post anything on this celebratory day, this year my subconscious saved the day. I have had a hankering to bake a pie for several days now, and yesterday I decided at 6:37 pm that I simply had to bake this pie, for no real reason other than my inexplicably strong urge. I’ll take this as a sign that I am not only deeply connected to pie in ways even I don’t understand, but that I am also a huge nerd. So that’s an okay revelation for a Wednesday I guess. A word about sweet potatoes. Let’s clear up the confusion once and for all. Yams, a vegetable any good American associates with The Holidays, are not in fact yams at all. Never have been. Never will be. This is because yams don’t grow in the United States. They’re native to Asia, Africa, and other tropical regions – but most definitely not the USA. The confusion stems from hundreds of years ago, when Africans were forcibly brought to New England and identified these native sweet potatoes as similar to the nyami they had back home. The name, or at least an iteration of it, stuck. To add to the confusion, neither yams nor sweet potatoes are potatoes at all. They are tubers. For more mindblowing data on the difference between sweet potatoes and yams, check out this great post on Zoë Cooks. For our purposes right now, the main take-away is that you are not crazy for thinking that “yams” and sweet potatoes are strangely similar, in fact too similar to differentiate. The confusion and self doubt ends now. The only thing left to wonder about is when to bake a sweet potato pie. I was lucky enough this time around that my good friend Ani agreed to take this pie off my hands as soon as it was cool enough to do so. As such, I wasn’t going to have a chance to taste the final product or photograph a slice. 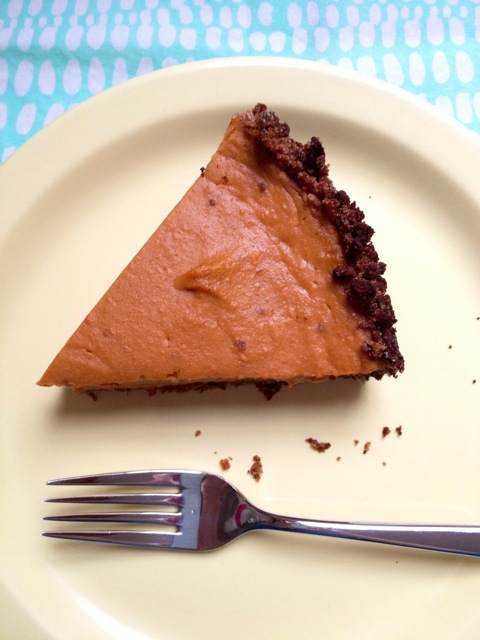 Luckily Ani has a gifted photographic eye and a keen sense of taste, and was gracious enough to provide a couple of beautiful snapshots as well as a review of this Pi Day pie. Look ‘n smell – filled the whole house with a warm nutty smell – color is beautiful. Filling – super creamy – pudding-like when still warm, but firmed up perfectly (and was still creamy). Loved the sweet potato flavor – not too sweet. 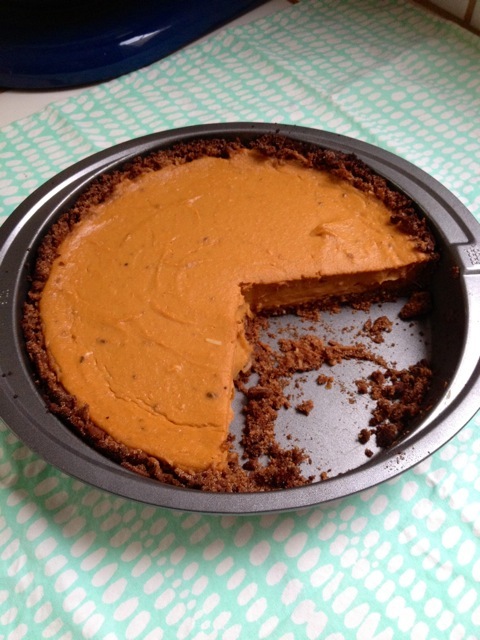 Crust – great crunchy contrast to the filling. Also great flavor contrast with the slightly sweet coconutty taste. Overcooked a smidge, with an over-toasted taste (not actually burned, just super brown). Mix everything in a large bowl until all of the crumbs are moistened. Grease a 9 inch baking pan. Press crumb mixture into the bottom and up the sides as high as you can. Let chill in the fridge for about 1 hour. While the crust is chilling in the fridge, prepare the filling. To mash the sweet potatoes, peel and cut into chunks. Add to a pot of boiling water and boil until soft (about 10-15 minutes). Drain and let cool, then mash completely. Place the mashed sweet potatoes in a large bowl. Add the salt and spices and stir well to mix. Add the remaining ingredients and whisk until smooth. 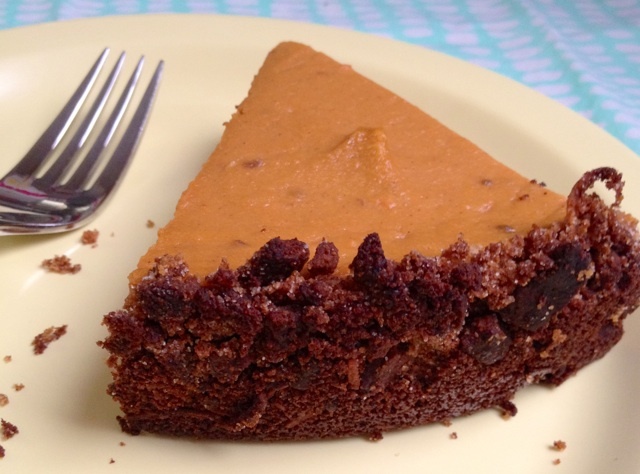 At this point you can use a hand blender or regular blender to get the filling extra smooth. Bake at 375°F for 45-60 minutes, until the filling is set on top (I took mine out at 45 because the crust was beginning to char and it looked plenty done). It should stay pretty firm if you jiggle the pan. Let cool completely on a wire rack. To prevent the crust from over-cooking, I recommending covering lining the rim of the pan with tin foil about 25-30 minutes in. 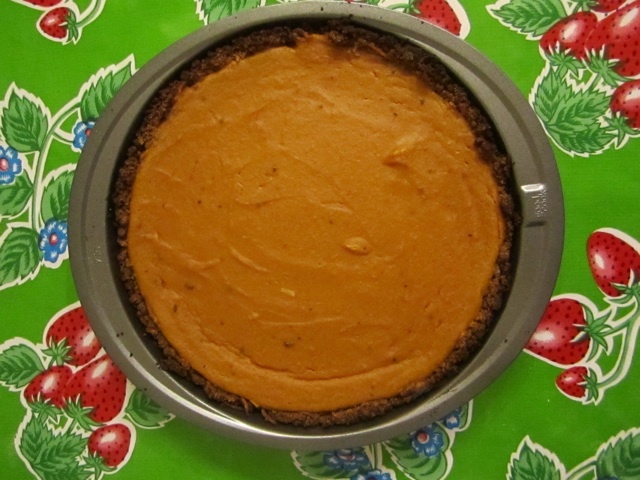 This entry was posted in Pie, Vegan and tagged coconut, pie, sweet potato, vegan. Bookmark the permalink.